The importance of specific aspects of IT vary by company; however, the foundational technology needs are universal regardless of size or industry. Just as Abraham Maslow published his hierarchy of human needs in 1943, technology has reached a level of maturity for organizations. They, too, have a basic technology requirement before the company can thrive and grow. If a company ignores security, pro-active service, fault tolerance, or data backups, they can still function as a company but are exposed to undue risk. You may be fortunate enough to avoid problems for a period of time, but if you are in business long enough, costly problems will arise that hinder successful growth. Regardless of how your organization handles technology, it is important that you consider and evaluate each category below. To help ensure IT is stable, we have attempted to list the most common concerns tied to the role in your organization. If your business is small, the CEO, CFO, and CIO may all be the same person. In a larger organization, it may be one to several people. Regardless of your size and structure, you must weigh the risk vs. cost for each of these items that are not consistently managed. 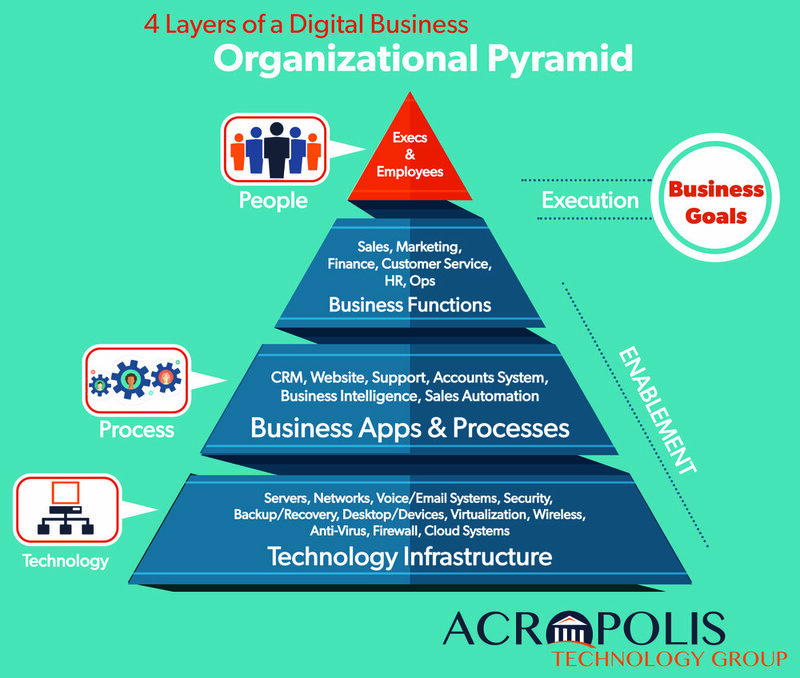 Acropolis Technology Group can help you understand the risk and reward so you can establish what is critical and how it relates to your business. Once determined, "we meet you where your IT is today" and put a plan in place that economically helps you get to where you want to be tomorrow. This can come in many forms: from simply supporting your existing IT department to acting as a second opinion for your current IT solutions. If it makes sense for your business, we can just be your IT department. We are not a "one size fits all organizations" company. We serve companies with fewer than 20 users and as many as several hundred. Call us for a hassle-free meeting to see if working together makes sense for both of our organizations. Peace of Mind that IT is "Handled"
Call us at Missouri: 314.890.2208 Illinois: 618.254.8733 or fill out the form below.